Volunteer Profile: Des Rosenberg - TADSA - Technology for Ageing and Disability (SA) Inc. 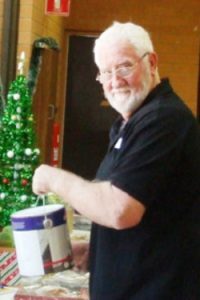 In 2013 Des saw a TADSA ad looking for Volunteers and having time on his hands thought he’d be able to help people with disabilities. He believed the skills he had developed in wood work, metal work and furniture restoration would benefit TADSA clients. Des brought other skills from building speed boats and a houseboat (which was built on his front lawn) to restoring a house and gardens in Mt Pleasant which Des and his wife Marilyn ran as a B&B. Marilyn also joined the Mt Peasant /Gumeracha Hospital Auxiliary which she ran and organised successful fundraising activities. While Des came to TADSA to be a Technical Volunteer, Project Coordinator Ralph Drage recognised that Des’s interpersonal skills would be more useful to TADSA as a Project Coordinator and that’s where Des found his niche. In 2015 Des was nominated by a TADSA client for a Channel 10/Messenger Newspaper Local Hero Award for his work with TADSA. Des is pictured above at one of TADSA’s end of year parties. Des’s working background was in telecommunications. He progressed through all of the technical officers’ classifications with the PMG (the Post Master General Department for those readers under 60) and then Telecom. His last position was Customer Service Manager, Adelaide South. He was also seconded to the SA residential Telecom Board. As a Project Coordinator Des has managed many of the projects built by TADSA Volunteers but his most memorable was the bouncer (similar to a baby bouncer) made for a 13 year old client. 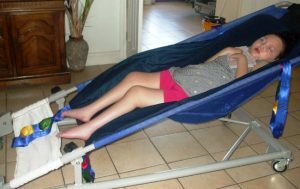 The client couldn’t spend a long time in her wheelchair, as it put too much pressure on her spine. So when she was not in her wheelchair, she was on the floor. Her mother suggested a bouncer and two TADSA volunteers built it. Joe Tieste made the metal frame and the other volunteer Theo Van Deventer shaped the material and attached it so it supported the client in the most comfortable way. Des likes this project for a number of reasons particularly how the mother and daughter got so much satisfaction out of it. He also appreciates how Joe and Theo went the extra mile to make the project a reality. Theo found the most appropriate material from a company in Western Australia, while Joe improved on the initial design which would have had the bouncer stationary and in one place, by making the frame narrower it could go through doors and by adding wheels it could be moved to other rooms and outside.